Thanksgiving is here and it is time to start making the plan for a wonderful celebration. You can leave all your transportation arrangement to us as we have the best Limo Service Long Island that will do the job. If you are coming to the city to explore the beauty and fun of Thanksgiving, we will be delighted to arrange your transportation. So what exciting things can you do on Thanksgiving Day to have a memorable event? Of course, enjoying a home cooked meal is a huge tradition for the Thanksgiving Day but if you want to do something different, you might want to ditch your kitchen apron and go out for a nice dinner with your loved ones. You can be sure of finding the perfect dinner for your family Thanksgiving Dinner. With our cheap Limo Service Long Island, you can enjoy a luxurious and comfortable ride to the diner in style. You might want to do the extraordinary by taking a tour of the wineries in Long Island. Really, you don’t have to stay at home all day cooking and playing host or hostess to friends. You can actually take this special day to take a tour of the wineries in Nassau County NY. You can engage our Long Island Party bus for your tour, especially if you are going with some friends and family. And when you are done taking a tour of the wineries, you can head over to some exciting destinations in the county on Thanksgiving Day. You can visit the Brassiere American Restaurant and enjoy a freshly prepared Thanksgiving Buffets. If you are coming to New York during Thanksgiving Day, then you should prepare to take part in the Macy’s Day Parade. This is a special event that features giant character clowns, marching bands, balloons, and cheerleaders. You can arrive at the event venue with our Luxury car service Long Island and create an impression for yourself. If you are coming into the city through the airport, we can provide our Long Island Airport Limo Service for both your pickup and drop off at the airport. If you want more outdoor fun apart from the Macy’s Parade, you can also enjoy the beautiful Bryant Park Winter Village event. This is actually the first indication of Christmas, so if you really want to get your Christmas started early, this is the destination for you. Featuring free ice skating on the huge 17,000 square foot rink outdoor, you are sure to have a lot of fun. And with our Long Island Limo hourly rate, you can have a cost-effective ride to and from the destination. There are more than 150-holiday stores and eateries that you can explore at this destination, so you don’t have to worry about a single dull moment when you ride with us. The Turkey Trot is one of the family fun runs that you can enjoy on Thanksgiving Day. Our unique Long Island Limo Service will get you to all the destinations where the run is taking place. If you want to get rid of some calories and develop a hearty appetite before the turkey dinner, then you should not miss this event at all. 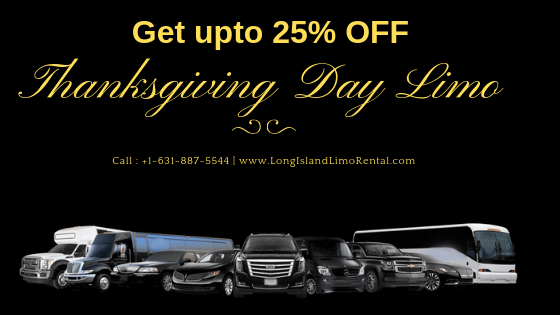 We will be delighted to arrange your Limo Service Long Island for Thanksgiving events this season and you can rely on us to provide you with top-notch service.